Apps such as Google Maps and Weather are great for finding out the weather at a certain place and how long it will take to get there. But chatbots are a much more convenient solution to planning a short day trip on any platform, and in the most centralized and natural way as an instant messaging conversation. Day Tripper is a simple chatbot that, upon receiving the user's destination as a simple address (Street, City, State) can then estimate the time that it will take to get there, as well as the overall weather for the day at that location. 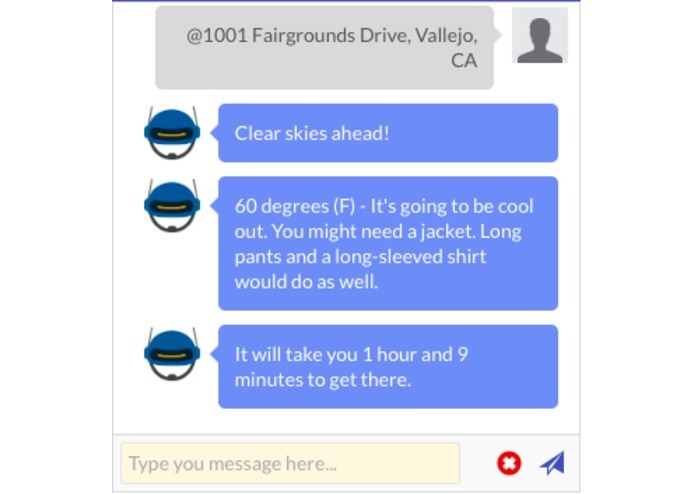 Given the weather and transit time data, the chatbot advises the user what to wear and informs the user of travel time in a natural conversational tone. We had challenges integrating the APIs with the chatbot. At first, we had trouble accessing the JSON data while using the Google Maps APIs, so we decided to utilize another map API (MapQuest). 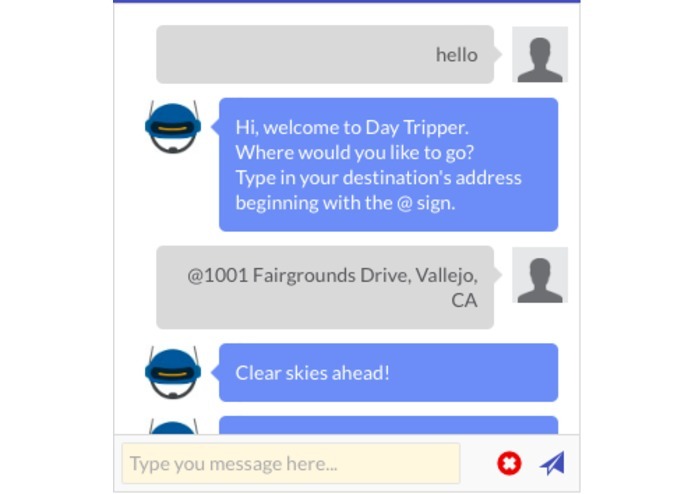 Day Tripper helped us gain experience in using chatbots, JSON files, and APIs. We also learned that creating simple and natural output can enhance the user experience in carrying out everyday tasks. Day Tripper will be expanded to be accessible on many more messaging platforms. The chatbot will also be expanded to include a list of directions to the selected destination. Entering the destination will be a more natural experience as well, with many more forms of input accepted (keywords, options, suggestions). I worked on integrating the OpenWeatherMap API for weather conditions information, as well as the MapQuest Directions API for transit time. I also created a conversational user experience. I worked on debugging the code and tried using the Google Maps API to tell the user how long it will take to reach their destination.